What Happens When I Try inkFrog for the First Time? Giving a third party access to your eBay selling account is no small thing. 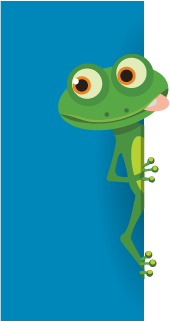 After all, you're on the hook for any listings that you create, sales that you make, and messages that you send—so it's only fair that you want to know exactly what InkFrog does when you try it out. After you sign up, which involves connecting your eBay account to inkFrog, all of your eBay listings will be imported and made available to you inside your inkFrog account. You'll find current listings under "Listings" → "Live"
You'll find sold listings under "Listings" → "Sold"
You'll find unsold listings under "Listings" → "Unsold"
You'll find scheduled listings under "Listings" → "Scheduled"
You'll see a bucket of all imported listings of any status under "Listings" → "Library"
Importing your listings doesn't change them or alter their status in any way on eBay; inkFrog is simply also making them available to you inside inkFrog. Your eBay listings will be imported into inkFrog and categorized shortly after you sign up. From the start you'll have be able to create new eBay listings or edit your existing eBay listings using inkFrog. A small banner will be added to the bottom of any new listings that you create or existing listings that you edit, to show shoppers that you're able to provide the enhanced levels of customer service commonly associated with inkFrog sellers. Users who upgrade to a paid inkFrog subscription can disable this message in the "Settings" → "Marketing" area of their inkFrog account. After singing up, you'll find that you don't need to do anything else to be able to track and manage your eBay sales activity from inside inkFrog. Your inkFrog dashboard will import your activity and immediately begin to display metrics. Your inkFrog dashboard will automatically track your sales and sales totals. The statuses of your listings—live, sold, unsold, paid, shipped, and so on—will automatically be updated in the "Listings" area of your inkFrog account. You'll also see and be able to respond to new messages from the eBay message center using inkFrog. You can also start using inkFrog for your messaging right away. These messages add professionalism to your selling activity and shoppers generally appreciate them. If you'd like to see samples or disable them, you can do so from within the "Settings" → "Marketing" area of your inkFrog account. "I use inkFrog daily to feed multiple eBay accounts. Saves so much time and it's very flexible. Easily pays for itself every month. Been using this app for 2 years." Your library of listings and images is automatically imported and begins to track your eBay activity. You can immediately respond to eBay messages from within inkFrog. And your seller communication is improved for you unless you choose to disable it. You can still manage your sales from eBay, for example by using Seller Hub, but you can also start testing the same workflows in inkFrog right away, so that you can see just how much inkFrog will improve your effectiveness. From there, you can begin to try new inkFrog templates, creating listings with inkFrog, connecting your other stores and selling channels, and customizing your inkFrog configuration and workflows. Now you know what happens from the moment you sign up for inkFrog and connect your eBay account. Sound good? Then what are you waiting for? Try it today!